Sbarro Health Research Organization | Real Research, Real Results. Together We Can Cure Cancer. Newswise — Inhibition of the cellular enzyme thymine DNA glycosylase (TDG) may be an effective treatment for melanoma, according to research published in the journal Oncogene in January. The paper, “Thymine DNA glycosylase as a novel target for melanoma,” describes how inhibition of TDG, known for its role in cell repair and proliferation, may be used to trigger cell death of cancerous melanoma cells and halt tumor growth. Researchers at the Sbarro Health Research Organization (SHRO) and the Sbarro Institute for Cancer Research, directed by Antonio Giordano, MD, PhD, also contributed to the study at Temple University. Scientists at SHRO assisted with statistical analysis of animal model data used in the study, among other things. The research was conducted by lead authors Pietro Mancuso, PhD, and Rossella Tricarico, PhD, in Bellacosa’s lab at Fox Chase Cancer Center, with a team of international collaborators including scientists at the Curie Institute, France, and at the University of Siena, Italy, where Mancuso was recently awarded the prestigious title of Doctor Europæus. “This study highlights the mission of SHRO to support junior investigators from Italy,” added Giordano. “This research was the PhD thesis of Pietro Mancuso, who I have had the privilege to co-mentor at the University of Siena, along with Prof. Bellacosa at Fox Chase, and Prof. Larue at the Curie Institute,” concluded Giordano. Patients with HER2 negative, hormonal receptor positive metastatic breast cancer experienced improved survival when treated with a combination of endocrine therapy and the new CDK-inhibitor, palbociclib. Results from a recent study, published in the Journal of Cell Physiology, suggest that palbociclib, in combination with either letrozole, an aromatase inhibitor, or fulvestrant, a selective estrogen receptor down-regulator, improves the so-called progression free survival in women with HR+HER2-metatastatic breast cancer by as much as 10 months when compared to endocrine therapy alone. Newswise — The Sbarro Health Research Organization (SHRO) at Temple University is dedicated to international research collaboration between American and Italian scientists, continuing the legacy of Italian leadership in the sciences since the time of ancient Rome. In that same tradition, SHRO has been thrilled to support Italian-American achievement in the arts, especially when those efforts serve the greater good through advocacy for public health and socially conscious subjects. This week, SHRO partners with the Italian Movie Award International Film Festival to support Italian-American work in cinema, particularly in recognition for accomplishments with the use of Virtual Reality (VR) in applications in medicine. The annual film festival, held each summer in Pompeii, is holding the first ever companion event in New York to present jury prizes with criteria to promote Italian-origin filmmakers living abroad, with particular attention to inclusivity of the filmmaker’s gender, age, and diversity. The festival award ceremony takes place December 10 at the The Paley Center for Media in Manhattan. “The Sbarro Health Research Organization is honored to participate in this year’s film festival awards and to support Italian-origin filmmakers around the world,” says Mina Massaro-Giordano, M.D. “The contributions of Italians to both medicine and culture represents a legacy that our organization is proud to carry on,” Massaro-Giordano says. As Professor of Clinical Ophthalmology at the University of Pennsylvania Scheie Eye Institute, Dr. Massaro-Giordano has collaborated with researchers at SHRO and is married to SHRO Director Antonio Giordano, M.D., Ph.D. The theme of this year’s film festival focuses on the future, which organizers have emphasized to celebrate the potential for a better future when medical-scientific research, technology and entertainment meet. The festival aims to inspire the next generation of filmmakers to explore new technologies, such as VR, by disseminating extraordinary results and patents obtained in research by SHRO in the use of VR in the medical-scientific sector. “We are proud to continue our multi-year collaboration between Italian Movie Award – International Film Festival and the Sbarro Health Research Organization, under the leadership of Dr. Antonio Giordano,” says Carlo Fumo, Italian film director and President and Artistic Director of the Festival. The event is in partnership with Plural + Youth Video Festival organized by the United Nations and in particular by UNAOC (United Nation Alliance Of Civilization), and the SHRO (Sbarro Health Research Organization) directed by Dr. Prof. Antonio Giordano. Begun in 2009 by founder and current president, director Carlo Fumo, who came up with the idea of a cinematographic international festival that could enhance Italy’s unique cultural and historical heritage and its tourist industry. More than a simple festival event, but a proper network of young experts able to create audiovisual works, spread the cinematographic culture by screening works coming from all around the world, attracting great personalities of the cinema to attend, and educating young people by means of masters and advanced training workshops. All these features, gathered inside the great region of Campania, have created a unique cultural, tourist and educational institution. Newswise — Italian-American Foundation, Filitalia, honors Antonio Giordano, MD, PhD, Founder & President of Sbarro Health Research Organization at Temple University with the Humanitarian award at the foundation’s 31st Anniversary Gala. Filitalia International & Foundation celebrates 31 years of commitment, dedication and service at their Annual Gala Dinner on Sunday, November 11, 2018. The foundation and its donors have contributed to initiatives championed by the Italian American community in the Greater Philadelphia area, among them the opening of the History of Italian Immigration Museum in 2014. “To be recognized as an example of the contribution of Italian-Americans in this country, by a foundation that was created by other professional, successful Italians, is a great honor,” says Giordano. In 1993, Antonio Giordano, M.D., Ph.D., founded the Sbarro Institute with a generous donation from Mario Sbarro, the Founder of the Sbarro restaurant chain, following Dr. Giordano’s discovery of the tumor suppressor gene pRb2. Giordano now serves as Director of the Sbarro Institute for Cancer Research and Molecular Medicine and Center of Biotechnology, at the College of Science and Technology, Temple University, as well as Professor of Pathology at the University of Siena, Italy. Giordano recently organized the medical conference, “The Impact of Environment and Healthy Lifestyles in Human Health,” at the National Italian American Foundation (NIAF) annual convention, with awards for achievement in medicine presented from the Giovan Giacomo Giordano Foundation. The research team lead by Giordano continues to make significant medical breakthroughs, including recent studies on the identification of a potential target for treatment of mesothelioma, understanding a protein that governs cell death in cancer, and further potential of the CDK9 gene to control the cell cycle. The Filitalia International & Foundation celebrates their 31st anniversary with other honorees including Lee Norelli, AP Construction – President, UNICO National, and Dr. Louis De Angelo, Superintendent of Schools for the Diocese of Wilmington, DE. Filitalia International is a non profit organization, founded in 1987 to promote and preserve the Italian tradition, language and culture worldwide. The goal is to consolidate and expand the Italian heritage through social events and humanitarian programs. Filitalia is committed in several projects, such as scholarships, Italian language classes, networking for young professionals and cultural events, by encouraging anyone to learn more about Italy and its heritage. The Filitalia Foundation 501 (c) 3 opened the History of Italian Immigration Museum with the aim to sustain Italian-American heritage through stories that resonate with diverse cultures, connecting the Italian-American community with its cultural roots, and sharing Italian heritage with people of all backgrounds. The organization was founded by cardiologist Dr. Pasquale Nestico, inspired by a love for his birthplace, Isca sullo Ionio, in Calabria, Italy. Nestico is joined in leading the foundation by past president Rosetta Miriello, and incoming president Marc Virga. Founder Pasquale F. Nestico, M.D. Legal Counsel Joseph Rollo, Esq. Anthony Colavita, MD – Joseph D’Ascenzo, Esq. Newswise — Inhibition of miR-24-3p reduced growth of cancer cells and was found to regulate proteins as a potential treatment target for Mesothelioma (MPM). The new potential target, and the method researchers have used to identify it, is an important step in addressing this challenging disease. MPM is a lethal cancer with increasing worldwide incidence and resistance to treatment. Despite this dreadful scenario, preclinical research has struggled to identify potential treatments. Researchers published their findings this month in Cancer Research, in the study titled A polysome-based microRNA screen identifies miR-24-3p as a novel pro-migratory miRNA in mesothelioma. MicroRNAs (miRNAs) are small, non-coding RNA molecules, which target genes and regulate gene expression and function. Abnormal expression of miRNA plays a relevant role in cancer biology and they are therefore a potential target for the development of innovative cures. Biffo, in collaboration with the Sbarro Institute for Cancer Research and Molecular Medicine at Temple University, University of Siena, Columbus University, Leicester University, and supported by GIMe, has conducted a research program that has made significant steps forward in the fight against MPM. “The first take home message for us is, ‘hunt where the ducks are,’” the authors say. “High levels of miR24-3p are detected only where they exert their biological effects (the polyribosomes), and increase tumour cell migration and Mesotheliomia progression via an enzyme family called Rho Kinase. These enzymes can be inhibited by specific drugs. Now it is time to translate our research into a pharmaceutical solution to develop this potential therapy,” the authors conclude. One of the iconic ingredients of the Mediterranean diet, which often has been associated with beneficial effects in the prevention of cancer as well as several other disorders, is extra-virgin olive oil. For thousands of years, olive trees were planted on Mediterranean coasts, initially by ancient Greek colonists, followed by several other civilizations and cultures, one generation after the other. This enduring agricultural practice led to the formation of the so-called “olive tree forest,” a monument to the Mediterranean environmental and cultural heritage containing millennial trees, found particularly in Southern Italy, in the Apulia region. Olive oil production from this region propelled and sustained olive oil consumption; however, this production is now endangered by a new, deadly plant pathogen, which arrived in Europe a few years ago. Fig. 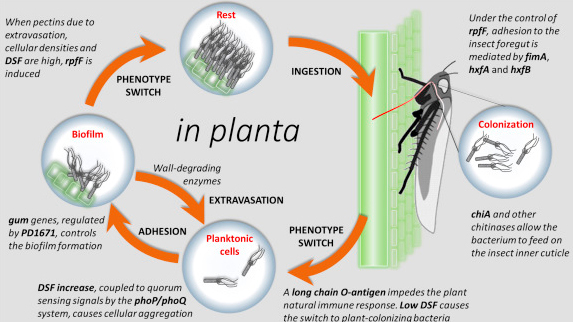 3 from original research article: Some molecular details of the X. fastidiosa life cycle. rpfF, fimA, hxfA, hxfB, chiA, phoP/phoQ, PD1671 are all bacterial genes differentially expressed at various stages. DSF stands for “diffusible signalling factor”. See full text article for further details. There is no established cure for the infection; however, containment policies applied in California to prevent further spreading of the epidemic of Xylella in vineyards seem to work, suggesting that similar policies should also be enforced in Italy – after taking into accounts the obvious differences between olives and grapevines. “As I learned by studying the available scientific literature, researchers from all over the world are working hard to find solutions, and there are indeed some promising approaches under study, aiming e.g. at blocking the infection or finding resistant olive cultivars – however, scientists need more time to accumulate stronger evidence. That’s why containing the infection in Southern Italy by all available means is crucial,” says Bucci, in line with the prevalent opinion in the scientific community. “I hope that my article, by providing a revision of all the best available scientific evidence, will inspire politicians and local authorities to follow the scientific consensus, instead of the opinions of non-expert influencers or isolated, controversial hypotheses which lack solid scientific ground,” concludes Bucci.